Do belong in the same sentence! I am a maturing female motorcyclist. I began riding my own motorcycles in 1979. In the intervening years I have learned that pavement is a good thing; keep the rubber side down and the helmet side up. Avoid grass and gravel at all costs; motorcycles, grass and gravel do not belong in the same sentence. I am fond of the electric start and have come to terms with the fact that I can not kick start anything – I mean anything, not even 70cc pit bike. At this point in my life, I admit my faults and move on; time is of the essence there is no time to waste. Having said this, I celebrated my 2010 birthday with a gift from my Loving Spouse, a Yamaha TW200 with electric start and the scheduling of my bunion surgery (I said there is no time to waste). After lowering the Yamaha 2 ½ inches, I can almost flat foot the bike. This bike has been a motorcycle riding epiphany! Grass, gravel and non-pavement riding is a blast. I live in an area with miles and miles of Federal, State and County forest roads and trails too numerous to mention. This is an area dreamed of by many and ridden by few. Often I see no other riders! It is a new day in my life – WOW – I find myself looking at the calender, prioritizing my responsibilities and planning a picnic lunch for my next ride. Laundry, yard work, cleaning the house, it can wait for a rainy day or next winter. Just look at the map – I haven’t ridden the Hogs Back Trail yet. Then there is the UP of Michigan – should I find the time to ride all the trails in Northern Wisconsin, I have another entire state close by. I enjoy the breathtaking awakening of the seasons, the tree leaves began to bud, now in full foliage and am looking forward to re-riding the same trails while viewing the fall colors from the seat of my beloved TW200. I am not a fast off road rider; there is no race I am savoring each and every moment. I understand why my Loving Spouse waited so long to get me this motorcycle; I would have done nothing around the house! 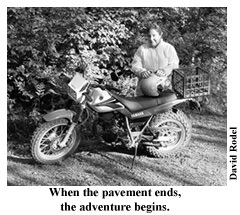 My recommendations for other women who may have an interest in non-pavement riding; A bike you are comfortable with, a GPS and/or good maps of the area, a good pair of riding boots and a good sport bra. Don’t wait, a new adventure is just around the next corner. Mary Ruth Rodel lives and rides in Southern Ashland County Wisconsin with her husband David. Look for her on the trails, she will be the one with a grin from ear to ear.